Corona Coffee owner Dean started this new business venture after plenty of years experience in the Coffee industry. The wealth of knowledge Dean brings to the 'Coffee table' (no pun intended) is unrivalled in the South-West. 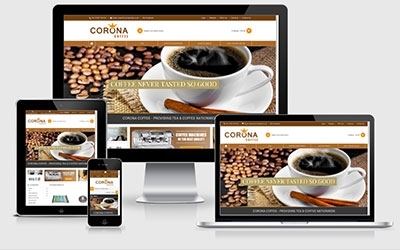 We helped Corona Coffee throughout, from creating a clean logo at the business's inception to launching a modern, responsive, eCommerce web solution. We asked EDSA designs to create a website from scratch and they did not disappoint. As a Coffee and Coffee Machine supplier we have an extensive range of products which needed to be displayed professionally due to the potential customers we would like to reach and attract. Sam the owner has a great passion for what he does and has the knowledge and creativeness to back it up. I would and do recommend EDSA designs without any hesitation. Thank you for all your hard work Sam!